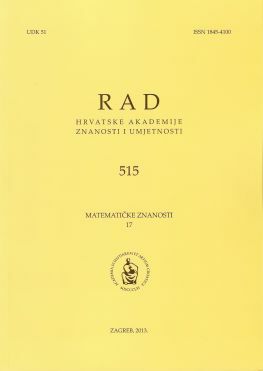 The mathematical journal Rad HAZU, Matematičke znanosti (Rad Hrvat. Akad. Znan. Umjet. Mat. Znan.) (ISSN 1845-4100 (Print), ISSN 1849-2215 (Online), DOI: 10.21857/94kl4cw3zm) publishes original research papers from all fields of pure and applied mathematics. It is reviewed, cover-to-cover, by Mathematical Reviews (MathSciNet) and Zentralblatt MATH. The Mathematical Citation Quotient of Rad HAZU for 2016 is 0.11. Beginning with Volume 15 (2005), Rad HAZU, Matematičke znanosti is indexed in the Emerging Sources Citation Index, which is a part of Web of Science Core Collection. From 2015, the journal is indexed in Scopus. CiteScore of Rad HAZU for 2016 is 0.33 (Q3), SJR 2016 is 0.229, SNIP 2016 is 0.594. The journal is published by the Croatian Academy of Sciences and Arts (HAZU). The members of Editorial Board are mathematicians, Full members and Associate members of the Croatian Academy of Sciences and Arts. Full texts for Volumes 1 - 21 are available on the digital arxiv of Croatian Academy of Sciences and Arts. Starting with Volume 15, full texts are available on Hrcak, Portal of scientific journals of Croatia. Submission of a manuscript implies that the work has not been published before (except in the form of an abstract), that it is not under consideration for publication elsewhere, and that it will not be submitted to another journal while under review for Rad HAZU. For detailed publication ethics, please consult Code of Practice of the European Mathematical Society. Manuscripts should be submitted electronically, preferably by sending a PDF file to the Editor-in-Chief to the e-mail address duje@math.hr. On acceptance of the paper, the authors will also be asked to transmit the LaTeX source file. Manuscripts should be written in English. The first page should contain the article title, author and coauthors names, complete affiliation(s) (name of institution, city, state, and zip code), proposed running head (less than 40 characters), a short abstract, a list of key words and phrases and the AMS 2010 Mathematics Subject Classification numbers. Figures must be prepared in a form suitable for direct reproduction (the preferred format is eps). References should be arranged and numbered in alphabetical order. The following information should be provided for references to journals: names and initials of authors, full title of the paper, name of the journal, volume, year of publication and first and last page numbers. Abbreviations of journal names should follow Mathematical Reviews. The authors will be asked to send also title and abstract in Croatian. At the request of the authors, the editors can provide a Croatian translation of the abstract. The editors would like to encourage submission of manuscripts written in LaTeX using this template.